It’s been 50 years since footage of tanks mounted with machine guns thundering through Detroit neighborhoods and blocks of buildings billowing with flames were broadcast into American homes. But in Academy-Award winning director Kathryn Bigelow’s riveting new film, “Detroit,” these events feel fraught with the same tension they did back then. More than 150 riots — or rebellions, as many historians, and to their credit even Bigelow and her cast have called them — struck American cities between 1965 and 1968. In 1967 alone, 83 people died and 1,800 were injured — the vast majority of them African Americans living in major cities where a racially-charged encounter between Black citizens and police led to state-sanctioned violence against U.S. citizens. With a total of 43 deaths, Detroit’s five-day uprising that year was one of the deadliest race riots of the 20th century." It was perhaps even more jarring because the polished, apolitical crooning of Motown portrayed a city not just manufacturing most of the nation’s cars, but often producing bubblegum pop that was safe for mass consumption. When Detroit went up in flames, so did Motown’s illusory version of it. The film’s lofty goals are admirable: to show how closely tied our past is to our present, and the historically unmitigated trauma that police brutality and the injustice of the American court system inflict upon Black America. Given the film is directed by a white woman and written by a white man — Mark Boal, Bigelow’s collaborator on both “The Hurt Locker” and “Zero Dark Thirty” — it succeeds incredibly well at these tasks, despite occasional moments where white guilt invades the narrative in arguably anachronistic and potentially historically inaccurate ways. Still, Bigelow deserves real credit for even making this film. Sadly the only female director to ever win an academy award for best director (for “The Hurt Locker”), she also deserves credit for dispelling the biggest myth that persists about the 1967 Detroit Riots, as they remain most commonly known. The myth, retold incessantly, is that the riots led to the city’s infamous decades of decline. The truth: by 1967, Detroit had already lost 130,000 manufacturing jobs in 20 years. Many companies had already relocated to the suburbs, and the highways that destroyed cramped, inner-city Black neighborhoods were making it convenient for whites to live outside the city. But this persistently repeated falsehood that the ‘67 riots are what destroyed Detroit conveniently places blame in the wrong community’s lap, and strips even current injustices damaging the lives of tens of thousands living there today, such as the ongoing tax foreclosures and water shutoffs, of their historical context. Bigelow’s film instead opens with a beautiful, eerie montage of text, crackling sound and animations based on artwork by Jacob Lawrence, a renowned African-American artist who chronicled the Great Migration from the South to the urban ghettos of the North. Condensing into minutes what the award-winning book “The Origins of the Urban Crisis” documents best, the montage serves as a critical historical corrective by informing the audience that even as Detroit was peaking at nearly two million people in the 1950s, the city’s eventual jaw-dropping decline had already begun. Among the main culprits: automation, white flight to the suburbs subsidized by the first federally-backed mortgages, and ironically, urban renewal, an Orwellian term for even vibrant Black neighborhoods being destroyed to make way for the construction of some of America’s biggest interstate highways. From there the film segues swiftly from the police raid on an after-hours club that sparked the uprising to the war-like cauldron of chaos Detroit quickly devolved into. When a National Guardsman mistakes a little Black girl for a sniper — a four-year-old did become the riots’ youngest victim when the Guard fired after her uncle struck his lighter near a window — the film matches historical records almost verbatim. Likewise, the real murder of a Black man carrying groceries out of a looted store by a white police officer (a composite character played brilliantly by the young, British actor Will Poulter), includes another officer joking about what a “physical specimen” the victim was. Police records indicate one of the real-life officers the film did not depict said exactly that. This kind of attention to even the rawest details is what makes the film for the most part unflinching. In the end, the 45 terrifying minutes the film spends at a seedy prostitution-haven known as The Algiers Motel with a handful of cops and their victims are what make the film so riveting. Three black youth died there and numerous others were badly beaten, including several members of the up-and-coming group The Dramatics (the film places only one former member in the motel, although in reality several members fled there for respite from the riots). Frequently, just like the characters, the audience spends long moments unsure who is alive and who is dead, as police use guerrilla interrogation tactics in an attempt to elicit confessions. Police originally suspected sniper fire from the now long-gone Algiers. The real crime there in the end: several groups of Black men fraternizing with a pair of white women. A starter pistol was fired from the motel in horseplay, leading to the police siege, but no gun was ever found. Still, when the film fictionalizes moments no definitive account exists for, it sometimes veers briefly into what feels like inauthentic terrain. When Larry Reed, a badly-beaten member of The Dramatics, escapes the night of terror at the Algiers, a white cop on the street comes to his aid, asking “Oh my God, who could do this to someone?”, whisking his “brother” off to a hospital. C’mon now. The film also portrays the National Guard and state police as hands off when Detroit cops get too bloody at the Algiers. The truth is a presidential commission later established by Lyndon B. Johnson found most of the deaths that occurred were due to these forces collectively going out of control. The Detroit Police were directly tied to 18 deaths, the National Guard, 11 deaths. Only 10 of the people who died were white, even though Detroit was more than 60 percent white at the time. Still, while a litany of coverage of the 50th anniversary of the ‘67 Detroit Riots resurrects the tragedy in at times dry and academic terms, Bigelow’s directorial style — tight shots, hand-held camera work, the deft use of explosions, slamming doors, gunshots and other ear-shattering sounds — does anything but. The film finally leaves the motel for a police precinct and courtroom drama that aren’t perfect. Scenes include senior detectives who anachronistically disparage the police who raided the Algiers as “racists.” A key Black character, Melvin Dismukes, — a security guard working nearby who tried to minimize the carnage at the motel — was portrayed as the central character in the film’s first trailer. Played deftly as man navigating the Black/white divide by John Boyega early in the film, after Dismukes is charged with murder along with the police in an apparent set up he becomes increasingly lineless, and how he got off absent white privilege is never explained. 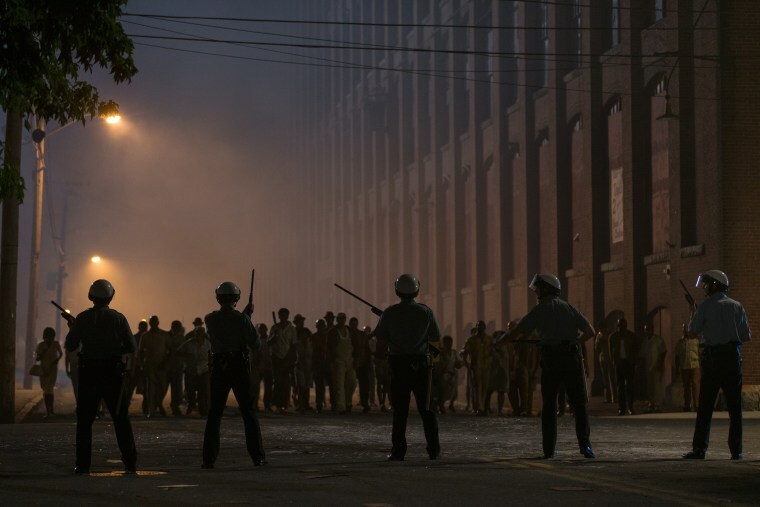 In an interview before the “Detroit” premiere, Bigelow defended the film’s fictionalized take on an actual historical event. She noted that “court documentation and research… really informed the script,” and defended the portrayal of several non-racists in the police department as verified by FOIA’d documents. In the end, three policemen and effectively the entire police department were cleared from murder, felonious assault, conspiracy, and conspiracy to commit civil rights abuses. While none of the real officers involved at the Algiers ever served as beat cops again, the city settled civil suits for paltry amounts, and no authorities ever were convicted of any crimes, although thousands of Blacks were arrested and convicted. Today, many of Detroit’s commercial and residential corridors have remained vacant since being burned down in 1967. Also today, as we all know, things akin to the Algiers Motel “incident” still happen all the time — a point Bigelow is obviously trying to make, to her credit. In a rousing introduction at the film’s Detroit premiere, celebrity academic and Detroit native Michael Eric Dyson, whose father moved to from Georgia in search for factory work decades ago, called Bigelow a “straight-up genius” and hero for “calling into question a culture of complicity” toward police brutality in America. “She has the gall and the courage and the unabashed temerity to tell the truth about what’s going on,” Dyson said. Bigelow’s electric new drama is the third in a trilogy of war films, both of which received widespread acclaim: “The Hurt Locker,” set in wartime Iraq, won six Academy awards, including best film, and “Zero Dark Thirty,” which focused on the assassination of Osama bin Laden, was nominated for five Academy awards. "Detroit" deserves similar recognition at next year’s Academy Awards, even if it’s far from perfect. That may be why Hersey agreed once more at his death to never allow his book to be made into a film.